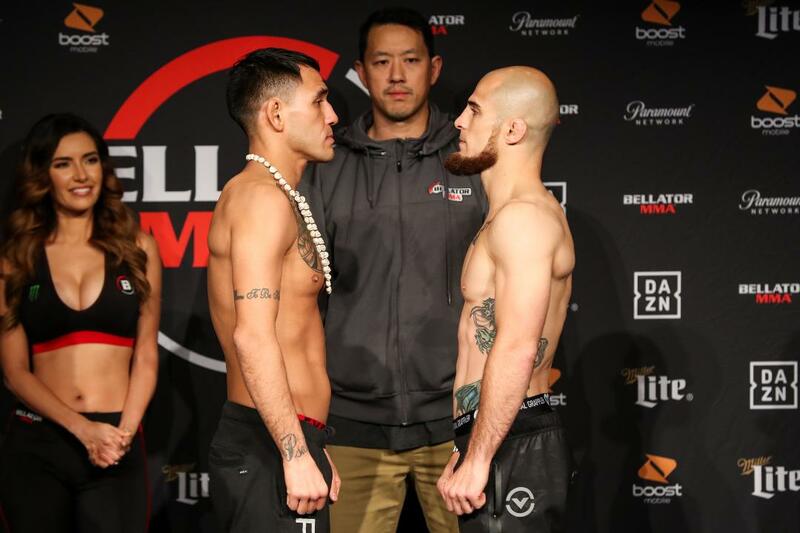 It’s once again fight day here at LowKickMMA, and the talent on display tonight (Friday, March 22, 2019) will come in the form of Bellator 218. Headlining the card are Emmanuel Sanchez and Georgi Karakhanyan, but there’s a whole bunch of great fights also taking place on the rest of the main card. Emmanuel Sanchez and Georgi Karakhanyan meet in a featherweight bout in the main event. In round 1, Georgi took him down early and got full guard. Sanchez did his best to defend off his back but it was all Georgi in this spot while landing significant strikes. In round 2, after stuffing a few takedowns, Sanchez gets one of his own and lands back mount of Georgi where he worked him over with some strikes. In round 3, Sanchez worked for a takedown in the early going. When Georgi went for one takedown, Sanchez almost landed an axe kick. Georgi was able to land a takedown in the middle of the round. They grappled to the finish. The judges gave the win to Sanchez. Valentin Moldavsky and Linton Vassell meet in a heavyweight bout in the co-main event. In round 1, Linton was able to score an early round takedown by Moldavsky got back to his feet where they clinched up against the fence. Linton once again got him down where he worked him over with strikes from half guard. In round 2, Moldavsky stunned him with a combo and Linton dropped to the floor. However, Linton recovered and transitioned to half guard where he sliced him open with elbows that caused a cut on his left temple. In round 3, Moldavsky scored a takedown of his own and landed some strikes from half guard. Moldavsky dominated this round with control and strikes. The judges gave the win to Moldavsky. Gerald Harris vs. Anatoly Tokov is next in a middleweight bout. In round 1, Harris dropped with him and swarmed with a series of strikes from the back that hurt Tokov badly. The referee didn’t step in which is amazing and the fight continues. Tokov was out of it as they clinched up against the fence. Tokov took him down to end the round. In round 2, Tokov got the guillotine choke and locked it in for the win. Opening the main card on Paramount Network is Will Lavine vs. Norbert Novenyi Jr. in a middleweight bout. In round 1, Novenyi Jr. took him down in the opening seconds and got his back. Will got back to his feet where they clinched up against the fence. Novenyi Jr. went for a standing guillotine choke but Will got out of it. Novenyi Jr. took him down again to end the round. In round 2, Novenyi Jr. took him down and just out grappled him. Novenyi Jr. landed some big shots while having his back. Novenyi Jr. locked in the head-arm choke win.